My 6x maternal great-grandfather Jean-Baptiste Bouchard was the father of ten children: five sons, four daughters, and one child of unknown gender. At least three survived, but only two of them married – my ancestor Joseph Prosper (b. 1743) and his sister Marie-Louise (b. 1752). Jean-Baptiste was born on 17 January 1698 in Montreal. He was a younger son of Jean-Baptiste Bouchard and Marie-Antoinette Chouart, daughter of the famed explorer Médard Chouart, sieur des Groseilliers. When Jean-Baptiste was 36 years old, he married Marie-Josèphe de Chavigny on 26 September 1734 in Beauport. Marie-Josèphe, who was 17 years old when she married, was a younger daughter of François de Chavigny, sieur de La Chevrotière by his second wife Geneviève Guyon. • Desgroseliers at his burial in 1755. Note: All locations are in the present-day province of Quebec, Canada. “Quebec” refers to the city of Quebec. The children’s surnames appear in parentheses. • buried on 27 April 1775 in Repentigny. • buried on 4 January 1741 in Quebec. • buried on 8 July 1742 in Deschambault. • married on 17 February 1772 in Châteauguay, Charlotte Nunegand dite Beaurosier, daughter of François Lunégand dit Beaurosier and Marie Louise Ouimet. * I've transcribed and translated Joseph Prosper's baptism record here. • buried on 20 June 1746 in Deschambault. • buried on 12 July 1748 in Deschambault. • buried on 23 August 1750 in Deschambault. • married on 2 March 1772 in Repentigny, Pierre Euphrosine Arnaud (Renaud), son of Henri Arnaud (Renaud) and Marie Marguerite de Chavigny and widower of Marie-Josephe Desjardins. • buried on 13 April 1755 in Deschambault. 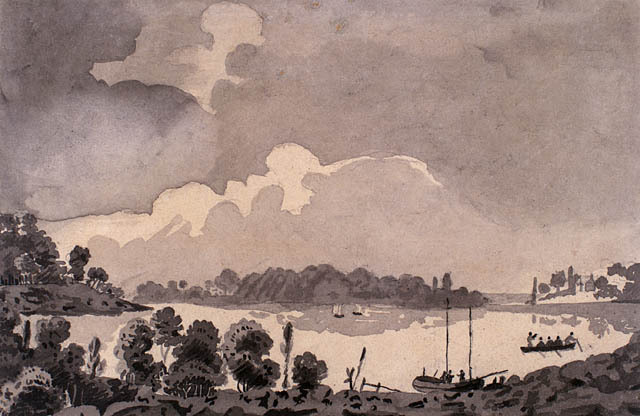 Image credit: “Repentigny, fleuve Saint-Laurent”, by George Heriot (1759-1839), Library and Archives Canada, Acc. No. 1989-470-14. 1. Notre-Dame (Montreal, Quebec), parish register, 1695-1699, page no. illegible, no entry no. (1698), Jean Baptiste Bouchard baptism, 18 January 1698; Notre-Dame parish; digital images, “Le LAFRANCE”, Généalogie Québec (http://www.genealogiequebec.com : accessed 11 May 2016). 2. Notre-Dame (Beauport, Quebec), parish register, 1720-1778, no page no., no entry no. (1734), Jean Baptiste Dorval de Groselier – Marie Joseph de Chevigny marriage, 26 September 1734; Notre-Dame parish; digital images, “Le LAFRANCE”, Généalogie Québec (http://www.genealogiequebec.com : accessed 10 May 2016). 4. St-Joseph (Deschambault, Quebec), parish register, 1713-1791, p. 56 verso, no entry no. (1755), Jean Baptiste Desgroseliers (written as Jean Baptiste Desgroseliers, indexed as Jean Desgroseliers) burial, 12 October 1755; St-Joseph parish; digital images, “Quebec Vital and Church Records (Drouin Collection), 1621-1967”, Ancestry.ca (http://www.ancestry.ca : accessed 10 October 2015). 5. St-Joseph (Deschambault, Quebec), parish register, 1713-1791, page no. illegible, no entry no. (1762), Josette Lachevrotieres burial, 20 July 1762; St-Joseph parish; digital images, “Le LAFRANCE”, Généalogie Québec (http://www.genealogiequebec.com : accessed 10 May 2016). 6. “Dictionnaire”, database, Programme de recherche en démographie historique (PRDH) (http://www.genealogie.umontreal.ca : accessed 13 January 2012), Jean Baptiste Bouchard Dorval Desgroseliers – Marie Josephe Dechavigny Lachevrotieres, Famille no. 19093. And, La-Purification-de-la-Bienheureuse-Vierge-Marie (Repentigny, Quebec), parish register, 1746-1775, p. 264 verso, no entry no. (1775), Marie Joseph Desgroseliers burial,  April 1775; Purification de la Bienheureuse-Vierge-Marie parish; digital images, “Le LAFRANCE”, Généalogie Québec (http://www.genealogiequebec.com : accessed 10 May 2016). 7. “Dictionnaire”, PRDH, Jean Baptiste Bouchard Dorval Desgroseliers – Marie Josephe Dechavigny Lachevrotieres, Famille no. 19093. And, Burgesse, “Les Registres du Postes du Roi”, 213. 8. “Dictionnaire”, PRDH, Jean Baptiste Bouchard Dorval Desgroseliers – Marie Josephe Dechavigny Lachevrotieres, Famille no. 19093. And, Notre-Dame (Quebec, Quebec), parish register, 1738-1743, p. 9 penned recto (p. 109 stamped), no entry no. (1740), Joseph Louis Dorval baptism, 3 September 1740; Notre-Dame parish; digital images, “Le LAFRANCE”, Généalogie Québec (http://www.genealogiequebec.com : accessed 10 May 2016). And, Notre-Dame (Quebec, Quebec), parish register, 1738-1743, p. 27 penned recto (p. 127 stamped), no entry no. (1741), [first name omitted] Dorval burial, 4 January 1741; Notre-Dame parish; digital images, “Le LAFRANCE”, Généalogie Québec (http://www.genealogiequebec.com : accessed 10 May 2016). 9. “Dictionnaire”, PRDH, Jean Baptiste Bouchard Dorval Desgroseliers – Marie Josephe Dechavigny Lachevrotieres, Famille no. 19093. And, St-Joseph (Deschambault, Quebec), parish register, 1713-1791, p. 8 recto, no entry no. (1742), Marie Louise Dorval baptism, 12 May 1742; St-Joseph parish; digital images, “Le LAFRANCE”, Généalogie Québec (http://www.genealogiequebec.com : accessed 10 May 2016). And, St-Joseph (Deschambault, Quebec), parish register, 1713-1791, p. 9 verso, no entry no. (1742), Marie Louise Dorval burial, 8 July 1742; St-Joseph parish; digital images, “Le LAFRANCE”, Généalogie Québec (http://www.genealogiequebec.com : accessed 10 May 2016). 10. “Dictionnaire”, PRDH, Jean Baptiste Bouchard Dorval Desgroseliers – Marie Josephe Dechavigny Lachevrotieres, Famille no. 19093. And, St-Joseph (Deschambault, Quebec), parish register, 1713-1791, p. 10 verso, no entry no. (1743), Joseph Prosper Dorval baptism, 19 May 1743; St-Joseph parish; digital images, “Quebec Vital and Church Records (Drouin Collection), 1621-1967", Ancestry.ca (http://www.ancestry.ca : accessed 17 May 2016). And, St-Joachim (Châteauguay, Quebec), parish register, 1768-1775, pp. 36-37, no entry no. (1772), Joseph Prosper Desgroseliers – Charlotte Nunegand marriage, 17 February 1772; St-Joachim parish; digital images, “Le LAFRANCE”, Généalogie Québec (http://www.genealogiequebec.com : accessed 30 June 2015). 11. “Dictionnaire”, PRDH, Jean Baptiste Bouchard Dorval Desgroseliers – Marie Josephe Dechavigny Lachevrotieres, Famille no. 19093. And, St-Joseph (Deschambault, Quebec), parish register, 1713-1791, p. 20 recto, no entry no. (1746), Joseph Eleonard Desgroseliers baptism, 23 May 1746; St-Joseph parish; digital images, “Le LAFRANCE”, Généalogie Québec (http://www.genealogiequebec.com : accessed 10 May 2016). And, St-Joseph (Deschambault, Quebec), parish register, 1713-1791, p. 20 verso, no entry no. (1746), Joseph Eleonard Desgrozeliers burial, 20 June 1746; St-Joseph parish; digital images, “Le LAFRANCE”, Généalogie Québec (http://www.genealogiequebec.com : accessed 10 May 2016). 12. “Dictionnaire”, PRDH, Jean Baptiste Bouchard Dorval Desgroseliers – Marie Josephe Dechavigny Lachevrotieres, Famille no. 19093. And, St-Joseph (Deschambault, Quebec), parish register, 1713-1791, p. 25 recto, no entry no. (1748), François Eleonord Desgroseliers baptism, 12 May 1748; St-Joseph parish; digital images, “Le LAFRANCE”, Généalogie Québec (http://www.genealogiequebec.com : accessed 10 May 2016). And, St-Joseph (Deschambault, Quebec), parish register, 1740-1748, p. 26 recto, no entry no. (1748), François Eleonore Desgrozeliers burial, 12 July 1748; St-Joseph parish; digital images, “Le LAFRANCE”, Généalogie Québec (http://www.genealogiequebec.com : accessed 10 May 2016). 13. “Dictionnaire”, PRDH, Jean Baptiste Bouchard Dorval Desgroseliers – Marie Josephe Dechavigny Lachevrotieres, Famille no. 19093. And, St-Joseph (Deschambault, Quebec), parish register, 1713-1791, p. 34 verso, no entry no. (1750), Marie Françoise Desgroseliers baptism, 31 July 1750; St-Joseph parish; digital images, “Le LAFRANCE”, Généalogie Québec (http://www.genealogiequebec.com : accessed 10 May 2016). And, St-Joseph (Deschambault, Quebec), parish register, 1713-1791, p. 35 recto, no entry no. (1750), Marie Françoise Desgroseliers burial, 23 August 1750; St-Joseph parish; digital images, “Le LAFRANCE”, Généalogie Québec (http://www.genealogiequebec.com : accessed 10 May 2016). 14. “Dictionnaire”, PRDH, Jean Baptiste Bouchard Dorval Desgroseliers – Marie Josephe Dechavigny Lachevrotieres, Famille no. 19093. And, St-Joseph (Deschambault, Quebec), parish register, 1713-1791, p. 44 recto, no entry no. (1752), Marie Louise Desgroseliers baptism, 7 November 1752; St-Joseph parish; digital images, “Le LAFRANCE”, Généalogie Québec (http://www.genealogiequebec.com : accessed 10 May 2016). And, St-Paul (St-Paul-de-Lavaltrie, Quebec), parish register, 1786-1795, page no. illegible, entry no. S.12 (1795), Marie Louise Dégroseillier burial, 12 April 1795; St-Paul parish; digital images, “Le LAFRANCE”, Généalogie Québec (http://www.genealogiequebec.com : accessed 10 May 2016). And, La-Purification-de-la-Bienheureuse-Vierge-Marie (Repentigny, Quebec), parish register, 1746-1775, p. 232 recto, no entry no. (1772), Pierre Arnaud – Marie Louise Desgroseliers marriage, 2 March 1772; Purification de la Bienheureuse-Vierge-Marie parish; digital images, “Le LAFRANCE”, Généalogie Québec (http://www.genealogiequebec.com : accessed 10 May 2016). Although Marie Louise and Pierre were first cousins (their mothers were sisters), their marriage record does not mention if they received a dispensation to marry. 15. “Dictionnaire”, PRDH, Jean Baptiste Bouchard Dorval Desgroseliers – Marie Josephe Dechavigny Lachevrotieres, Famille no. 19093. And, St-Joseph (Deschambault, Quebec), parish register, 1713-1791, p. 54 verso, no entry no. (1755), [unnamed child of unspecified gender] Desgrozeliers burial, 7 November 1752; St-Joseph parish; digital images, “Le LAFRANCE”, Généalogie Québec (http://www.genealogiequebec.com : accessed 10 May 2016). 16. “Dictionnaire”, PRDH, Jean Baptiste Bouchard Dorval Desgroseliers – Marie Josephe Dechavigny Lachevrotieres, Famille no. 19093. And, Cyprien Tanguay, Dictionnaire généalogique des familles canadiennes, 7 vols (1871–1890, reprint, Montréal: Editions Elysée, 1991), II: 367. And, Notre-Dame (Quebec, Quebec), parish register, 1743-1748, p. 70 verso stamped, no entry no. (1748), Marguerite Dorceval baptism, 2 November 1748; Notre-Dame parish; digital images, “Le LAFRANCE”, Généalogie Québec (http://www.genealogiequebec.com : accessed 10 May 2016).